Bullitt is a movie based on the book Mute Witness by Robert L Fish. Even though this movie is based on a book, it does not have an over whelming plot. Luckily this movie stars the king of cool, Steve McQueen as Bullitt. This film is definitely more style then story. The story starts out with Bullitt assigned to protect a witness, his team doesn’t do so well. This turns Bullitt into a rogue detective, breaking some of the rules to find the people responsible. The cars and the city of San Francisco are just as big of stars as the actors in this film. Peter Yates does a great job of making this film look interesting and real. The editing flows well and won Frank P. Keller an Oscar. Of course this movie is best known for its great car chase scene with McQueen in his Mustang and the bad guys running a Dodge Charger. The scene has no music, just the sound of 2 American Big Blocks roaring through the streets. Steve McQueen was known as a great driver and did some of his own driving in the scene. If you’re a car nut you will love this car chase, maybe the most famous in cinema history. 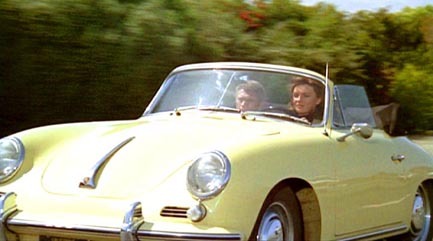 I’m a Porsche guy so I personally love seeing Jacqueline Bisset drive McQueen down the highway in her yellow Porsche 356 Cabriolet. For those that didn’t already know, Steve McQueen was a motorhead, he loved cars and motorbikes. He owned many interesting vehicles, and Porsches where a big part of that collection. Interesting trivia on this film is McQueen was inspired by real life San Francisco Detective Dave Toschi for his character. Toschi is most famous for being the lead detective on the Zodiac Killer Case. He was portrayed by Mark Ruffalo in David Fincher’s Zodiac(We will review this movie in the future). He was also the inspiration for Dirty Harry, one of Clint Eastwood’s most famous characters. Besides McQueen, Bisset who plays Cathy, Bullitt’s girlfriend also stars. I do wish she had more screen time in this movie, she is a very minor sub-plot. We also see Robert Vaughn as a possible corrupt politician. Some of the supporting cast highlights are Norman Fell as the police captain and my favorite, Robert Duvall as a taxi driver. Bullitt is required viewing for noir buffs, car buffs, and movie buffs in general.